After five years of contracting omnishambles and nearly one year of NUBSLI‘s campaigning against the biggest framework for interpreting services we’ve ever seen in the profession, we are still waiting for the biggest mess ever to occur. This blog has recorded and commented on, over those last five years, the damage that large contracts taken by large agencies have done to the Deaf and interpreting communities. The trend of ever larger contracts continues despite everything over the last five years pointing to this not benefiting the Deaf community. They are no longer Customers, it is now the government department or Contracting Authority i.e. NHS trust, MoJ, DWP and AtW. The interpreter is no longer the Supplier, it is now the Agency. Layers of administration come between Deaf people and interpreters with choice and control removed and interpreters are left fighting for a sustainable career which if they do not have leaves the Deaf community without an adequate supply of quality interpreters who can afford to work full time and be members of the community. The national framework is being designed by the Crown Commercial Service (CCS) to bring three existing frameworks together. The most important ones for BSL are RM738 face to face interpreting and the Ministry of Justice’s (MoJ) national framework. The companies that won places on the RM738 framework were: The Big Word, Prestige Network and Language Line. For the MoJ a monopoly was handed to ALS then taken over by Capita. Not a specialist BSL agency in sight. No, all they were left with were sub-contracts to these big guns who knew nothing about Deaf people. Interpreters were left fighting for their rates as the squeeze was on for everyone to get their cut. Although standards were written into the MoJ the competitive mess sub-contracting brought about meant many experienced court interpreters left it to those who’d accept less. The excellent interpreters booked directly and well-respected by individual courts were pushed out unless they were willing to jump through administrative hoops and be booked by subcontracted agencies, one of whom knew little about legal work, the other dropping its own standards for the sake of saving its business. Meanwhile with RM738, standards were not exactly high on the list of priorities. With nothing written into the actual framework and scant monitoring agencies were free to use whomever they chose and unqualified signers with GCSE level qualifications they used. And they cared little. One of three, the Big Word, proclaimed publicly in its evidence to the Justice Committee in 2012 that its, “extensive partnering with local suppliers, including SMEs and the voluntary and third sector (sic) ensures that contracts can be filled at a local level”. The reality is they’ve been one of the biggest blights on the sign language interpreting profession over these five years with Capita being another. 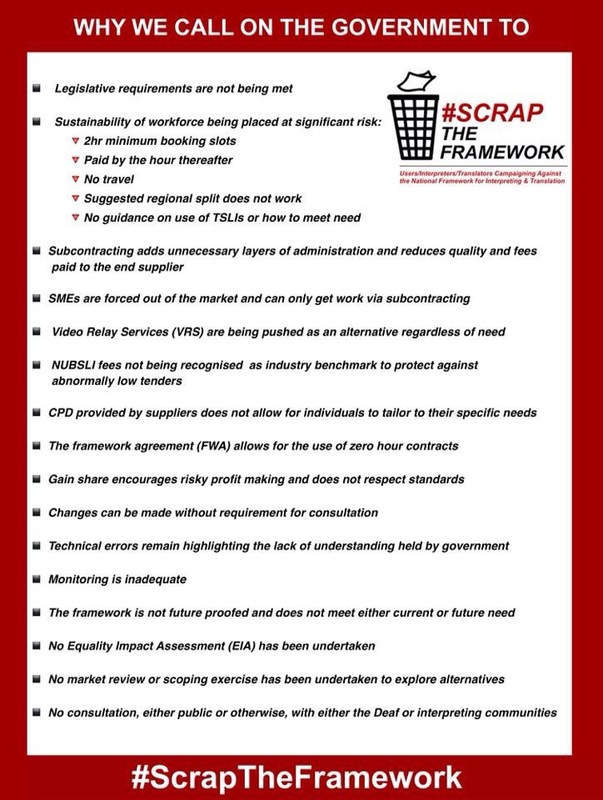 Five years on we have a national framework proposed which is based on the same principles as the others. The strategy seems to be increase administration and sub-contracting (which supposedly fills the government’s SME agenda), ignores the work of the registers (by dictating that agencies produce ID cards and provide CPD to interpreters) and fails to measure or understand the basic needs that interpreting services should be designed to fulfil. On their procurement pipeline, the CCS states, “We do not set policy on how public sector organisations provide access to interpreting services nor do we determine the appropriate qualification levels for interpreters in particular circumstances. The offering is broad and it is for individual customers to establish their requirements in line with their policies when creating a contract under the framework agreement.” This is just one example of a clear lack of respect in setting standards or even understanding them in the first place. With basic groundwork not done by government departments the national framework, RM1092, is a house of cards built on quicksand. Those who think that standards have been written in and therefore everything with this framework is now perfectly fine would do well to review the NUBSLI visual above and consider each of the points made. Standards written into a document is one thing, there are many other implications of what such a large, badly planned framework can have. Especially when it is designed to cover every type of interpreting, including Access to Work (AtW). Any choice and control in interpreting provision Deaf people had left is about to be removed and if sustainable fees are not paid to interpreters the knock on effect will likely to leave the profession, and the Deaf community, devastated for years to come.